JG has always been one of my most favorite places for lunch in New York. I love the room, the sun streaming in the windows and the quiet luxurious sense of the room. 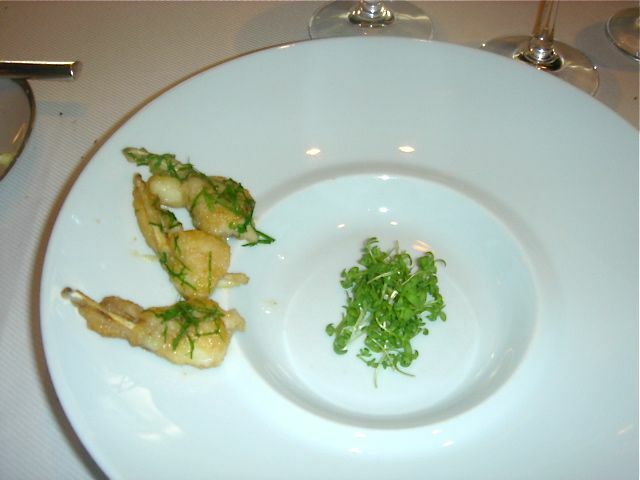 I just don’t understand what has happened to the food – it is as if the chef de cuisine is not tasting his sauces. 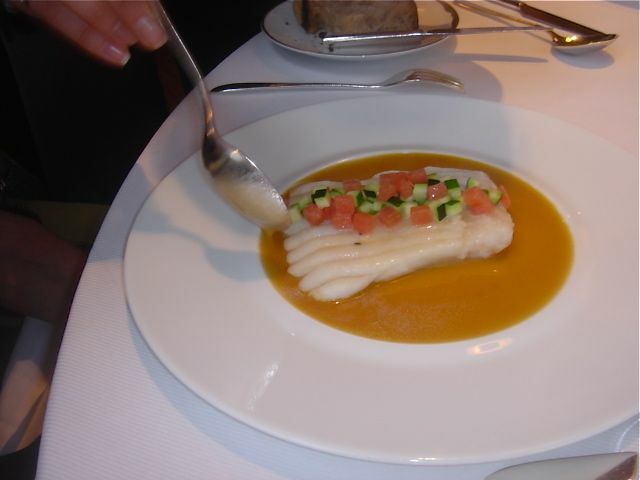 Where Le Bernardin excelled at every single sauce, JG barely managed to get one right. 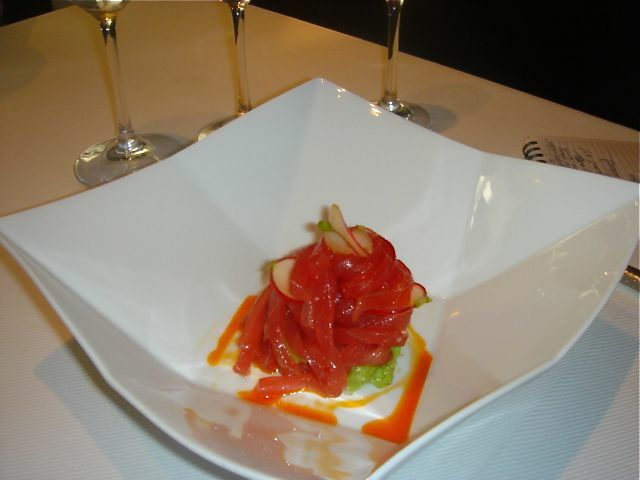 Yellow Fin Tuna Ribbons, Avocado Puree, Spicy radish, Chili Oil, Ginger marinade – the saucing was added tableside and I found that the tuna was drowned out by the saucing which added a very unpleasant acidic note. 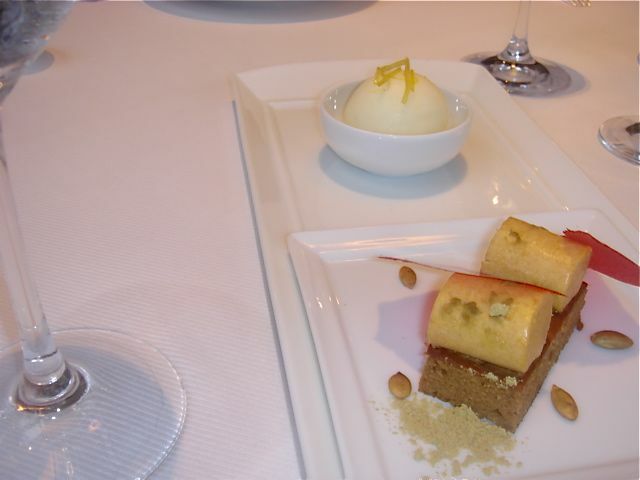 I just don’t understand what has happened to Jean Georges. 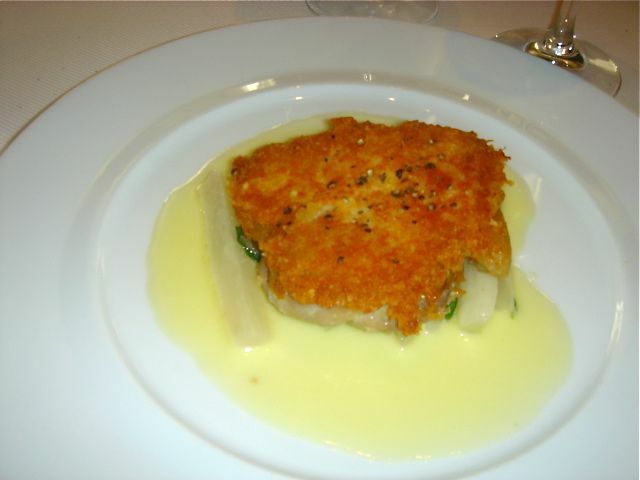 For some reason, the flavor balance is off – either way too much citrus or too much acidity. 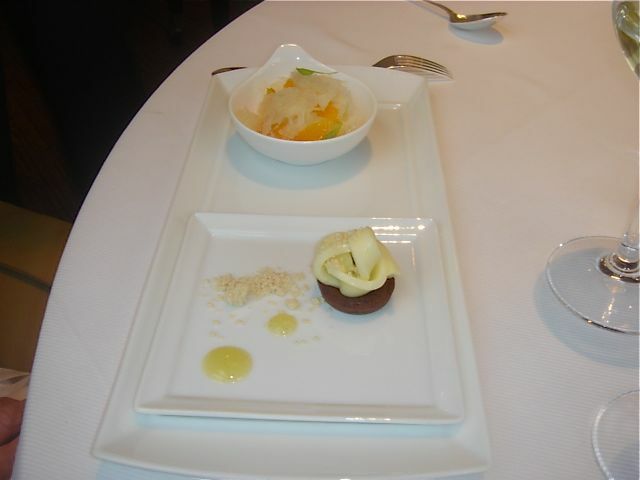 Before our trip to France, we decided to have lunch at Jean Georges – a great antidote to bad airplane food. A friend of ours joined us and contributed a Raveneau Chablis Monte de Tonneau 2001 to the festivities. 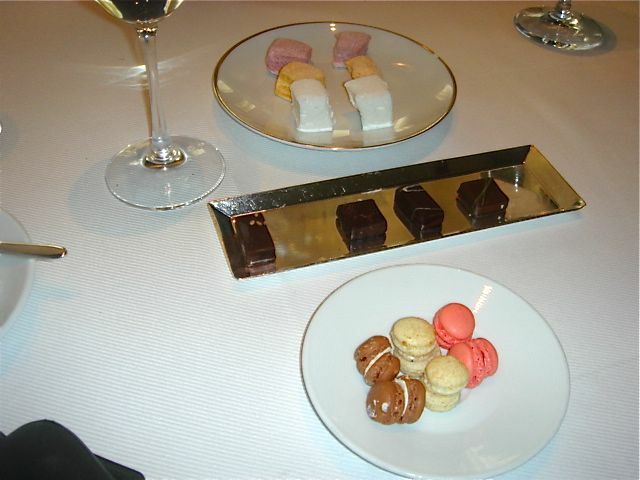 We opened the festivities with NV Pierre Gimonnet Champagne. Always nice. 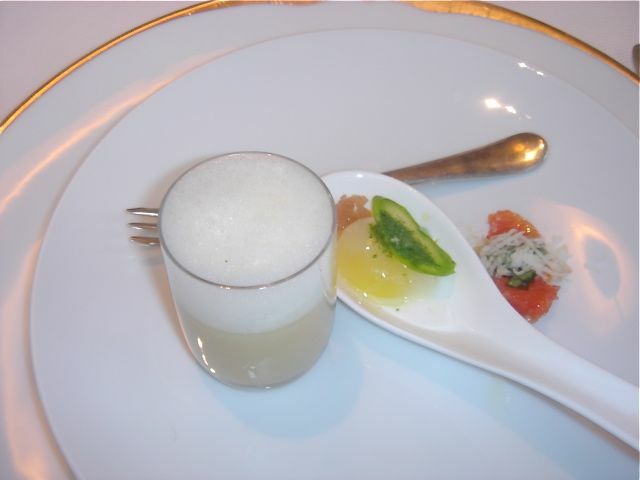 Amuse—miso bacon soup, slow cooked quail egg with asparagus and a dehydrated grapefruit with pecorino cheese. 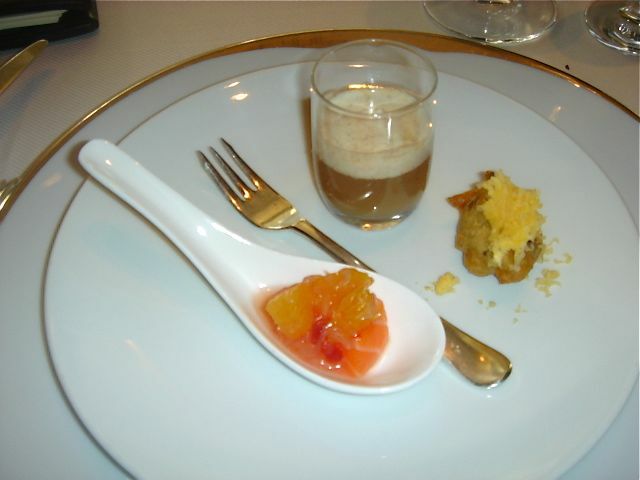 The gapefruit was basically tateless, but the other two amuse tastes were ok…the soup was best. 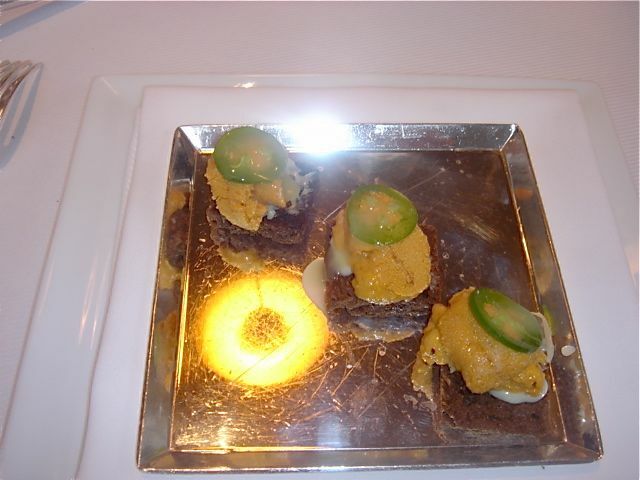 1st course—Santa Barbara Sea Urchin, toasted black bread topped with a slice of jalapeno pepper and a dab of yuzu “sauce”. 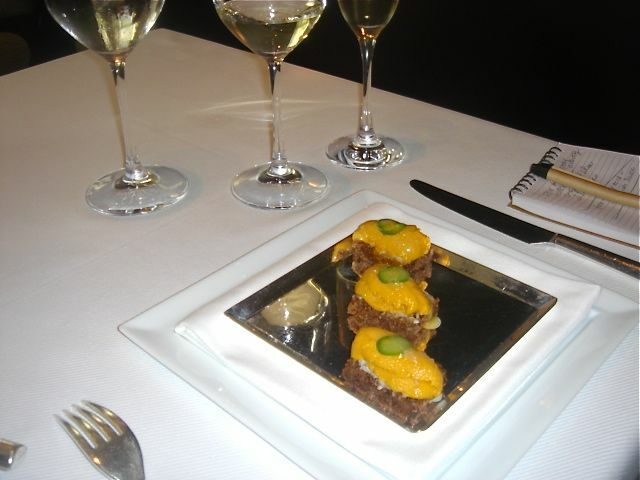 Absolute perfect—the jalapeno added an incredible punch and the uni was A+++ quality. 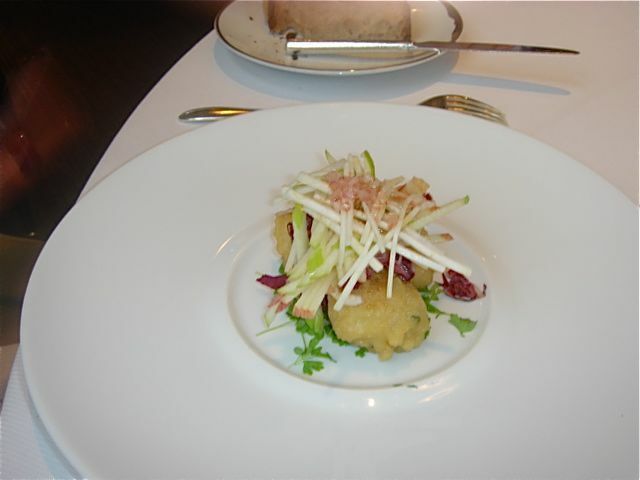 2nd course—my friend and I — Peekytoe Crab Fritters Honey crisp apples, pink peppercorn vinaigrette—excellent balance of flavors. 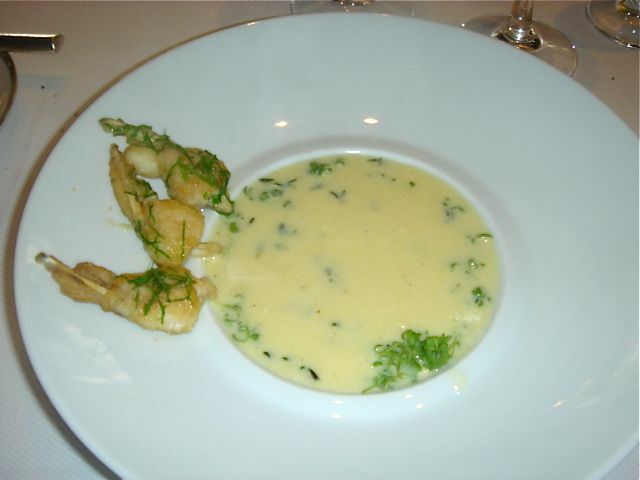 John—young garlic soup with thyme, sautéed frog legs. 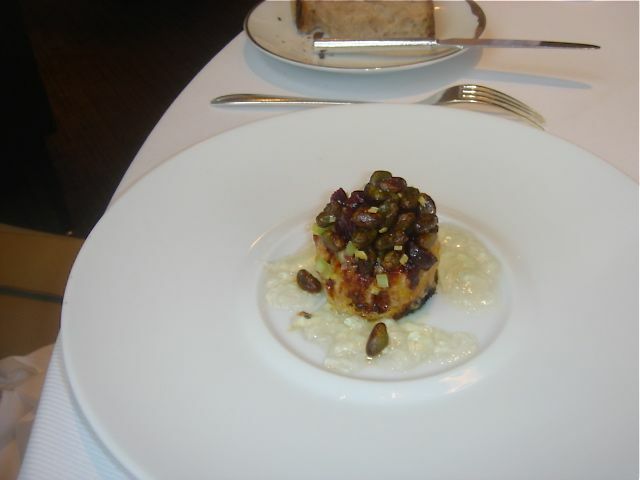 A Jean Georges signature dish and deservedly so—delicious. 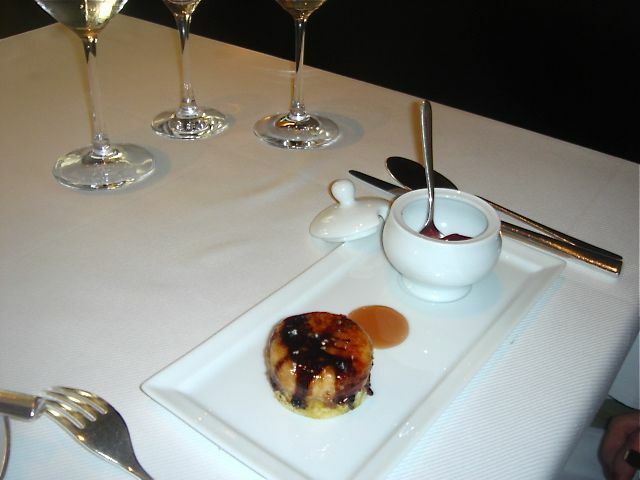 3rd course— my friend and I—foie gras brulee, dried sour cherries, candied pistachios and white port gelee—another Jean Georges signature dish and again a winner. 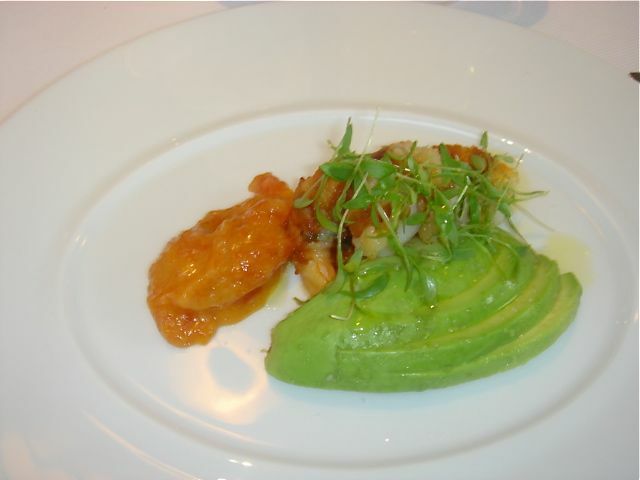 John—shrimp and smoked bacon, papaya mustard, avocado—John said “fair”. 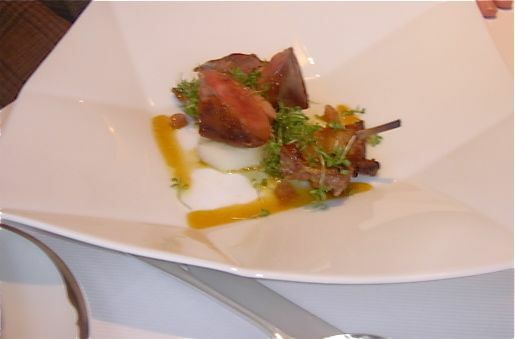 Friend—smoked squab a l’orange, Asian pear,candied tamarind—He must have loved it as the plate was cleaned quickly. 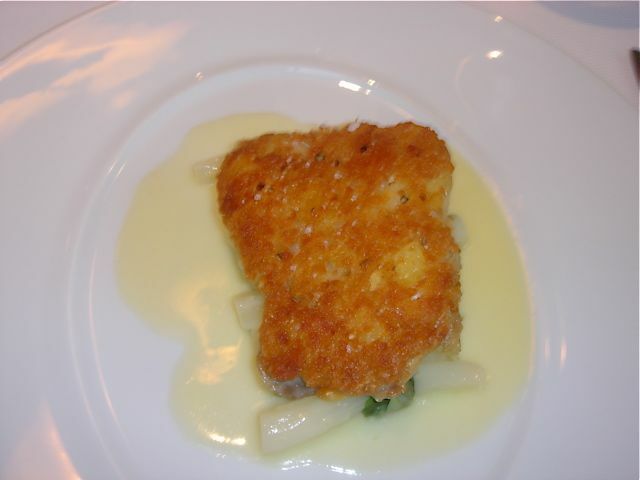 John—parmesan crusted confit of leg of chicken, salsify, basil and lemon butter—plate licked clean—superb! 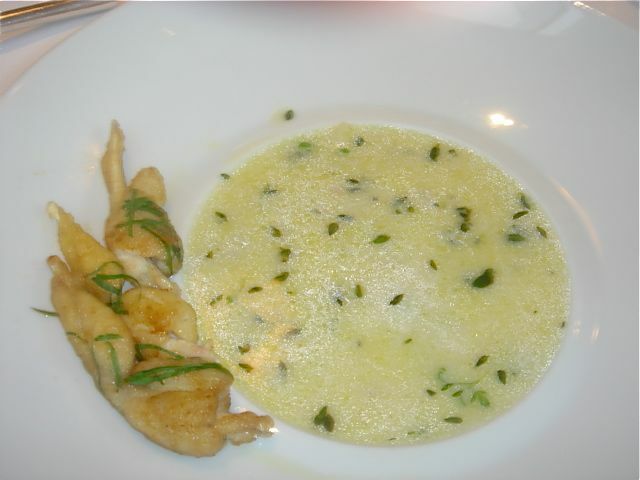 Me —skate with Chateau Chalon Sauce—as soon as this was served warning bells sounded. 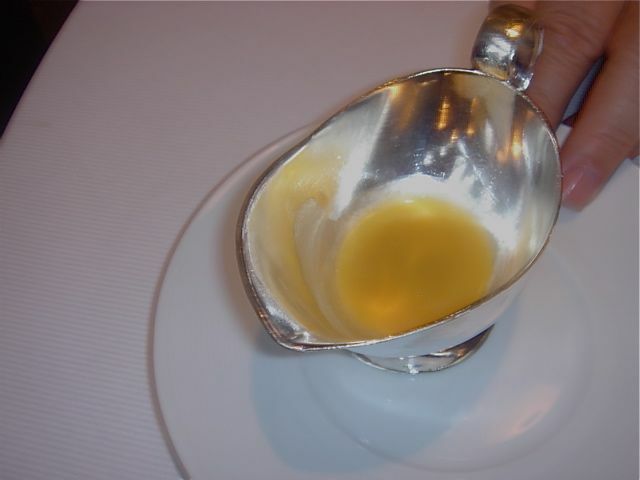 The sauce is normally a sunny bright yellow. This day the sauce was muddy brown. It was so acidic that it was inedible. 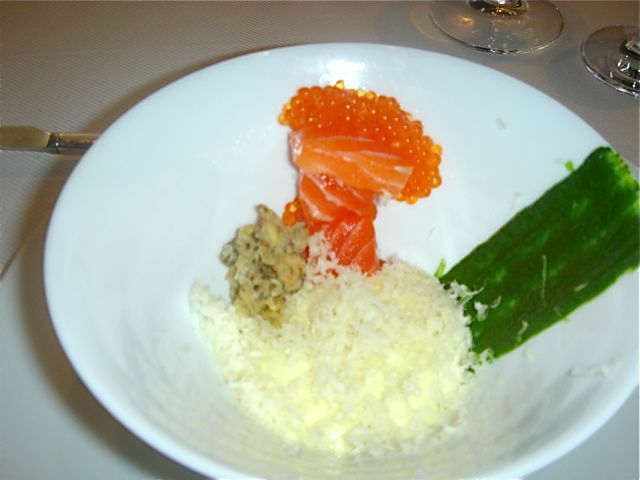 I sent the dish back and in the interest of time I ordered a repeat of the Uni dish that was so wonderful. It was. 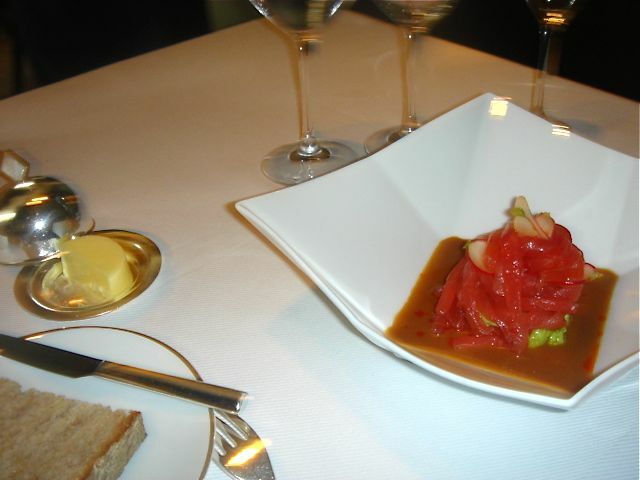 Chef’s re-do—Jean Georges was in his kitchen. He re-made the sauce and sent out “his batch” to have me taste. Much better.